We look forward to celebrating Palm Sunday with you this Sunday, when Jennie Harrop will continue our sermon series titled “Who Do You Say That I Am?” with a look at Jesus’ mother Mary. Before the service, please bring all toddlers, Pre-K, and elementary-aged kids to the back of the church to hear special instructions for carrying palm branches during the Call to Worship. After the Palm Sunday service, kids will enjoy an outdoor Easter egg hunt complete with plastic eggs, candy, gold coins, and prizes. For the Palm Sunday potluck lunch, A-H bring a main dish, and I-Z bring a side or dessert. During the Congregational Meeting following lunch, we will have teenagers ready to help younger kids with Easter crafts in the back of the Ministry Center so parents are able to listen well during the meeting. Three topics of particular importance at this Sunday’s Congregational Meeting will be (1) our 2018 Annual Report, which will be available on paper as well; (2) a brief discussion of the VitalChurch survey and next steps; and (3) a job description for an innovative part-time bivocational pastor position. 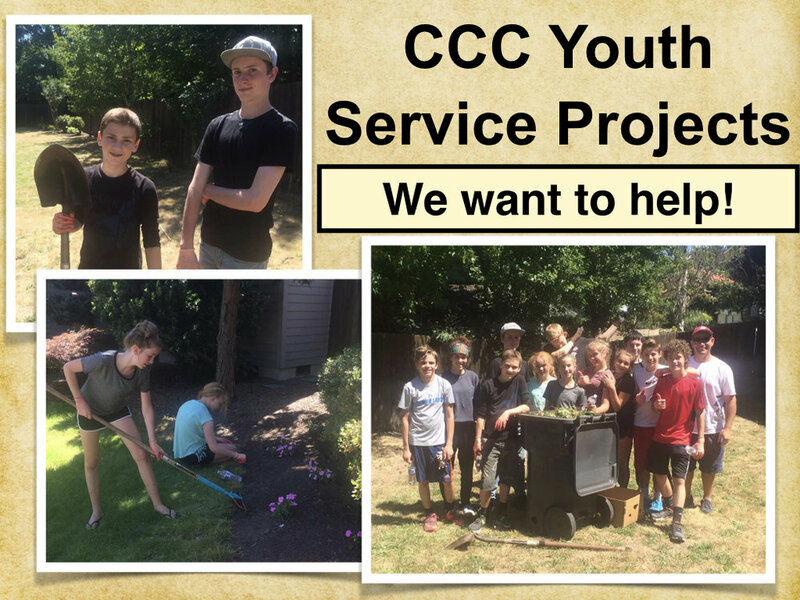 Join us so you can hear what’s new on the horizon for Cedar Creek! On April 19, plan to join us at 7 p.m. for a Good Friday Tenebrae service as we ponder together the day of Jesus’ crucifixion and prepare ourselves for Easter morning. Jennie Harrop will share the word on Good Friday. On April 21, join us at 10 a.m. for an Easter morning service that will affirm and empower in you the joy and hope we find in the resurrection of our Lord Jesus Christ. Matt Hilgaertner will be preaching on Easter morning. Let us assure you that the Lord has bold plans for our little church, and we are excited to step faithfully forward into them. Please join us as we seek God’s will in all that we do, giving thanks for the blooms amidst the rain as we go. May Christ bless your week with the Holy Spirit-gifted peace and joy that only He can provide. There are still 3 sites available for our 3 nights at Metzler Park in Estacada (a short drive from PDX)! Only $92! Notify the church office of your interest ASAP. Your payment secures your campsite. Note: No fireworks allowed this year. Donations Needed! 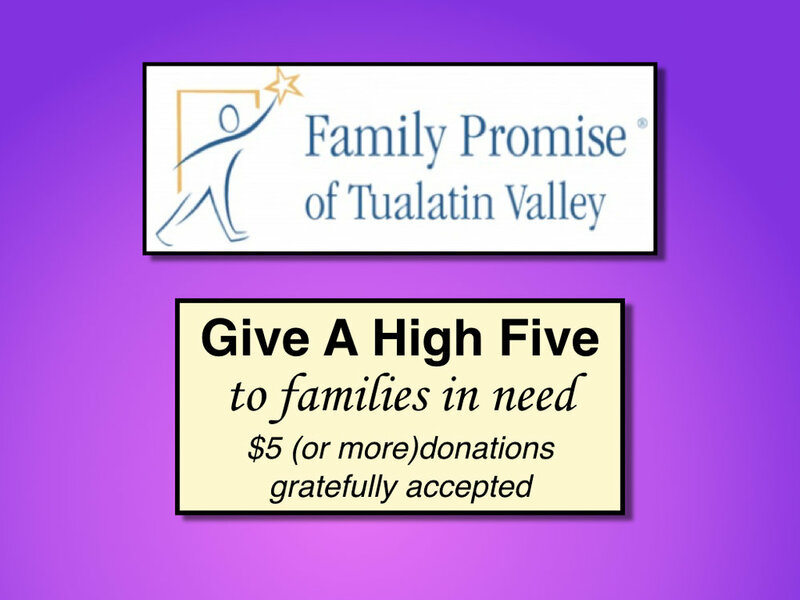 We could use any clean, used sets of Twin size sheets for use during the Family Promise week. They will be used by the families staying at the church. We would wash them afterwards and, keep them at church for the next week we have families stay. Contact Louie Olivares if you have any questions. Prayer Teams - We have a church prayer team that prays over all requests. Also, you may meet with someone at the end of Worship on Sundays for prayer; just come to the couches near the front windows after the service ends and someone will meet you. Willowbrook Food Pantry - The pantry is low on all Condiments, Chili, canned Refried Beans, Corn, Pasta Sauce, Crackers and Cookies. They also use plastic grocery bags & egg cartons. Please bring your donated items to the blue barrel at the front of the Ministry Center (Sanctuary). Our Nursery & Privacy Room are open at the back of the Sanctuary. Feel free to accompany your child there during the service if the need arises.